Birth of William Oliver registered September quarter 1889 in Dudley. 5 Hurst Lane, Tipton, Staffs. William Oliver (43 Stationary Engine Driver, born Dudley), his wife Mary (44, born Dudley), and their 5 children: John (20, Packer of Iron Sheets, born Barrow), Sarah (14, Domestic Servant, born Dudley), William (12, born Dudley), Alfred (9, born Tipton), Thomas (6, born Tipton). House in fields off Hurst Lane, Tipton, Staffs. William Oliver (52, Electric Crane Driver, born Dudley) and his wife Mary (54, born Dudley), and 2 of their 5 surviving children of 8: William (22, Chain Tester, born Dudley), and Thomas (16, Slipper Boy on Great Western Railways, born Tipton). Marriage of William Oliver and Mary Jane Langford registered December quarter 1914 in Dudley. The birth of their daughter Lillian M. Oliver was registered December quarter 1915 in Dudley. 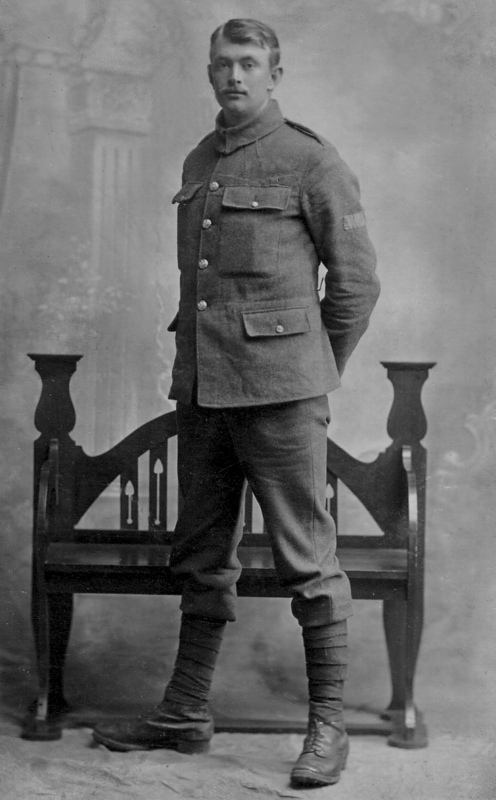 William enlisted on 4th September 1914 in Dudley, he gave his age as 26 years and 31 days (actually 25 years and 31 days). He was 5 feet 10 inches tall, had a fresh complexion, grey eyes and brown hair. He had a tattoo on his left forearm, and a scar at the back of his right ear. He was born in Dudley, was a Wesleyan, and gave his occupation as ‘Tester’, a 1917 Tipton Herald article reported him as a chain tester at Lloyds Proving House, Tipton. Was this man really a Tipton man? The Tipton Herald article of 9th June 1917 shows his address as Regent Street, Tipton, as does the Roll of Honour entry for the same day. He gave his ‘Last Permanent Residence’ as 120 Five Ways, Tipton, but then states his next of kin is his wife at 63 Regent Street, Swan Village, Woodsetton, nr Dudley. His other next of kin was his father whose address is given as 120 Five Ways, Tipton – was William thinking previous address? It seems that William was born in Dudley, had lived in Tipton, but was probably resident in Woodsetton. A sad aspect of this tale is that William’s daughter Lillian was born in late 1915 just after he had left for France and then Salonika, and father and daughter never saw each other. Lillian lived a long life, and died in 2014 aged 99 years. The 11th Worcesters landed in France in September 1915, but moved to Salonika just 2 months later. During 1916 they saw relatively little action, just the Battle of Horseshoe Hill in August, however the summer conditions were unpleasant resulting in a great deal of sickness. The severe winter of 1916-17 meant that the opposing troops just held their postitions, and it was March 1917 before the British troops began training for the first planned assault of the year which was to become the First Battle of Doiran, on 24th and 25th April 1917. The Worcesters were to attack the entrenched Bulgarians who were at the top of Spur O.6. above the Jumeaux Ravine. They first had to rush down the steep slope into the ravine, and then up the other side to engage the enemy. The advance began at 9.45pm, and the Bulgarians turned on 3 searchlights illuminating the ravine and their devastating artillery bombardment began. Despite the bombardment, and machine-gun and rifle fire, the Worcesters fought their way up the ravine and took the Bulgarian position on Spur O.6. plus an adjacent redoubt. The Bulgarian trench-mortars and artillery pounded the newly-taken positions, and a series of counter-attacks were repulsed by the Worcesters at grave cost. At 3.00am a final counter-attack was repulsed, but the Bulgarians were pushing in from both sides reducing the length of trench that the Worcesters were holding, whilst bombs and bullets were in short supply. At 4.00am the order was given to retire back across the ravine to their starting positions, and reached these lines as dawn was breaking. The 11th Worcesters had 5 Officers and almost 100 Other Ranks killed from the 23rd to 25th April, with a small number dying from their wounds on subsequent days. 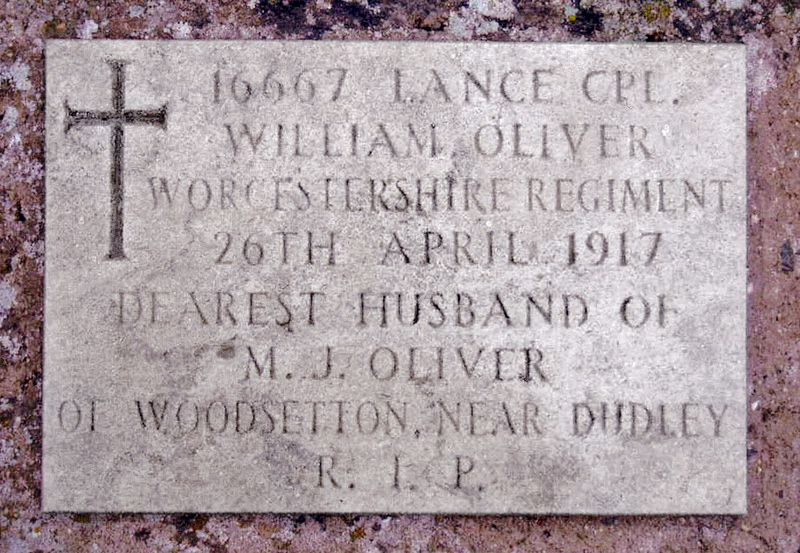 William Oliver was wounded, probably on the 23rd or 24th April, the family story is that William’s arm was blown off. He died from his wounds on 26th April and is buried in Sarigol Military Cemetery. When Lord Kitchener asked for volunteers for his Army, among the first to enrol was Lance-Corporal William Oliver (No. 16667 11th Battalion, Worcestershire Regiment). Enlisting on the 5th September 1914, he died from wounds received in action on April 26th 1917, after seeing fighting in France and then Salonica, where he met his fate. Always of a cheerful disposition, his letters invariably spoke of himself and everyone “being in the pink,” adding “thank the Lord for it.” Prior to the war he worked at the Lloyds British Testing Company, Tipton. Born in August 1889, he was only 27 years of age. He had always been highly respected, and it’s a surety that he lay down his life for home, King and Country. He leaves a wife and child, mother, father, brothers and sisters to mourn his loss. He stood over 6 feet in height. With thanks to TiptonRemembers.net for kindly sharing this research with us. With thanks to TiptonRemembers.net for kindly sharing their research with us. ‘Tipton Remembers’ recognises the fallen men of the wider Tipton area.